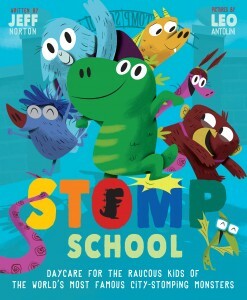 ‘Stomp School’ answers the question: when city-stomping monsters go to work, who looks after the kids? The picture book is about kaijus, Japanese for monsters. When the kaiju mums and dads go to work in human cities, they do what all monsters do: STOMP AND DESTROY! Meanwhile, the kaiju kids go to Stomp School to learn the finer art of destruction. Bold, bright, lots of fun and is sure to appeal to little monsters everywhere.